It had been five years since I last paddled this beautiful river. 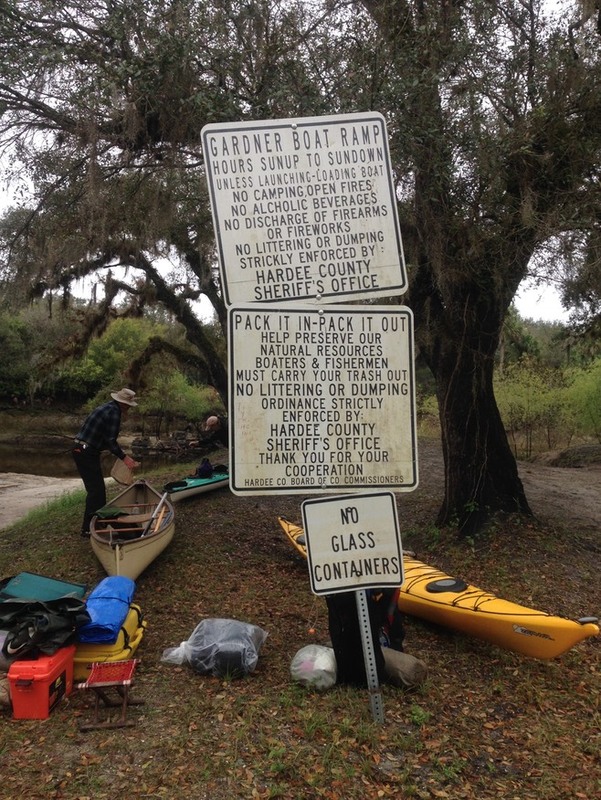 In 2012 I paddled a longer stretch on a seven day trip with Paddle Florida (paddleflorida.org). I remember the river as a wild, beautiful place, full of wildlife, so I looked forward to this trip, expecting much the same. 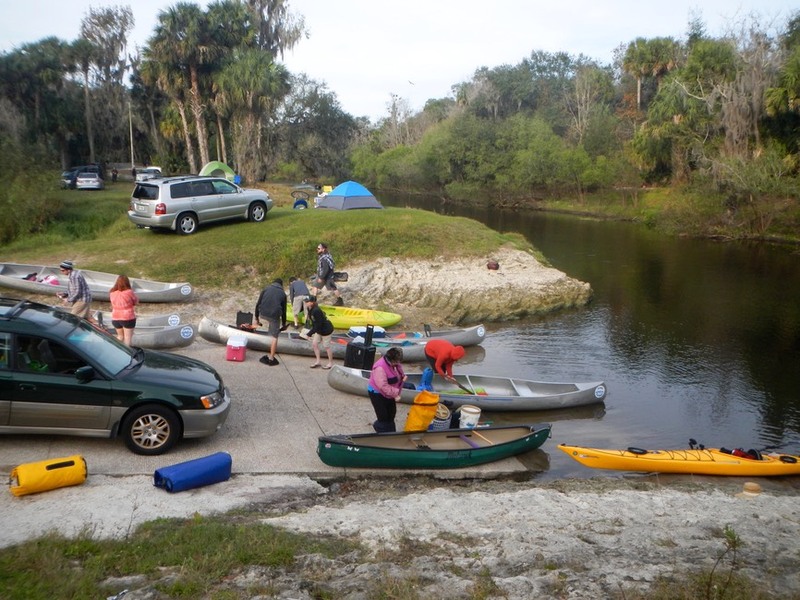 This adventure was sponsored by the Florida Sport Paddling Club and was lead by Linda Leeds. It was a three day, nineteen mile trip with only two days on the river: much shorter than my previous trip. 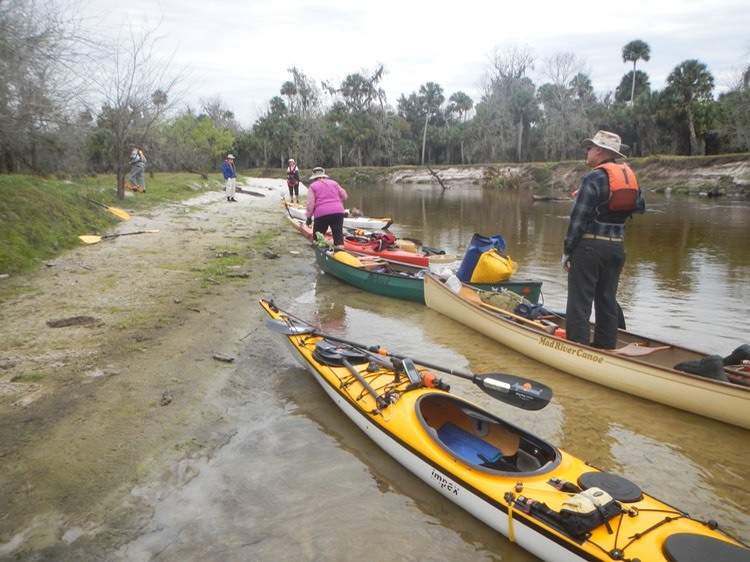 Paddlers congregated at Pioneer Village Park in Zolfo Springs, Florida on the Friday before launch. The Pioneer Park is quite interesting with many buildings illustrating how early settlers in the area lived and worked. A group of us went to dinner at the Pioneer Restaurant, a local place within walking distance of the park. The establishment was full of men dressed in “cowboy” attire: boots, jeans, Stetsons, bolo ties, the works. This was a visual reminder that we were passing through Florida’s cattle country (Florida is the second largest cattle producing state), surrounded by “Cracker Culture”. For uninitiated city folk, in Florida the term cracker is not an epithet hurled at racist white men. It is descriptive of the cowboy culture that developed here in the 1800’s when cattlemen used whips to direct herds with a loud crack: thus the term “Cracker” and “Cracker Culture”. It was said that these men were so skilled with a whip that they could take the head off a snake at twenty feet. 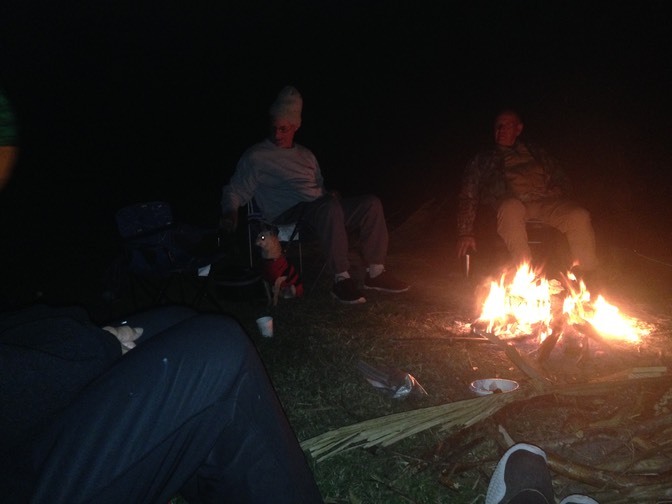 After a dinner of fried Mullet and hushpuppies, we all headed back to camp, enjoying a campfire before turning in. Next morning we got a leisurely start. Several folks went back to the Pioneer Restaurant for coffee and breakfast. I was one of them. After breakfast we began to move our boats down to the launch area only to be overwhelmed by an outfitter launching hoards of college age people heading for a weekend canoe outing on the river. They loaded big coolers, probably full of beer, tents, stoves and personal gear, accompanied by loud yelling and laughter as they fumbled and fell, trying to launch themselves. Boat by boat they headed down river to more loud laughter and the yelling of orders as they ricocheted from bank to bank, with the sound of wooden paddles clanking on aluminum canoes. Soon the cacophony faded into the distance, leaving us to wonder whether we would have any peace on the Peace River. Soon our little group was launched. This was a good group of experienced paddlers We stayed together, but didn’t paddle on top of each other and talking was kept to a minimum, allowing us to observe and enjoy the beauty of the river. We saw many animals, mostly birds, as it was too cold for gators to appear. Turtles were in evidence however, and I did see a river otter. We saw an occasional group of canoeists pulled up on the river’s banks, but they were well spread out and quiet. The video below illustrates what we experienced on this day’s paddle. After paddling about twelve miles we began to look for a campsite. The Peace is interesting in that there are no designated camping spots along its length. There is plenty of open camping along the West bank (the right side heading downstream), but don’t mistakenly camp on the East side as there are many unwelcoming no-trespassing signs along its whole length. I don’t know why this is. We checked out several sites and finally settled on a grassy flat area ten feet above the river, part of the river’s flood plane. The Peace was at record low water, almost too low to paddle. A rainstorm days earlier had added two inches to it’s water level, enough to get us through. At flood stage, the flat bank containing our campsite would be underwater. The day had been cool and overcast, but still pleasant for a Florida winter day. 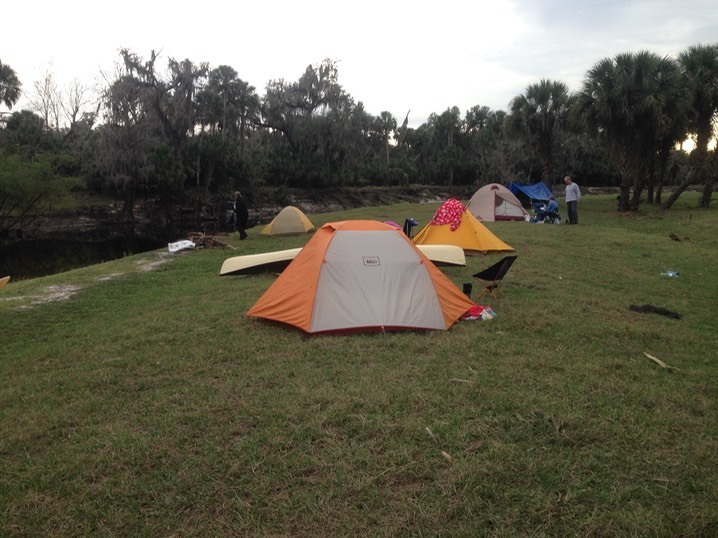 We arrived at our campsite sometime after 3:00 pm and immediately began setting up our tents. It was wonderful to be with such experienced campers who wasted no time in getting tents and sleeping gear ready for the cold expected that night. I was particularly impressed by Ken, who eschewed modern polartec gear for traditional wool garments. 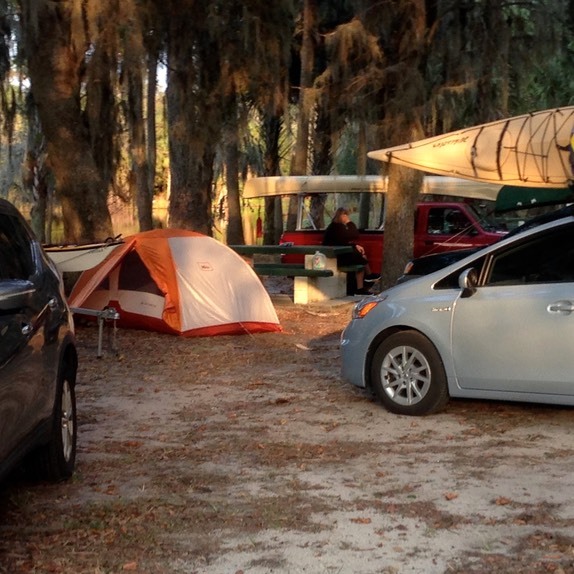 He set up well appointed campsite, and, on the water, was an artist with a paddle and canoe. Tom was also impressive, setting up the only hammock shelter in our group. It had a tarp covering his hammock and more, where he could sit and cook his meals out of the weather. Night came on quickly as it was still winter and standard time. We each prepared and ate our evening meal, then sat around a small campfire, warming our hands and feet, until cold and fatigue drove us into our tents sometime after 8:00 pm. I did my usual evening preparations of making notes, checking gear and reviewing photographs before doing a puzzle on my iPad, all the while sitting in my Crazy Creek chair shivering, with cold feet stuffed inside my sleeping bag. It would be a chilly night. As I bundled up and crawled in to sleep I could hear the nearby call of a Barred Owl and the distant howl of a coyote. I heard the rain begin around 1:00 am. It was light at first, then grew heavier, its intensity rising and falling through the night. Luckily there was little wind. Temperatures were in the low forties, but I was warm and dry in my tent. I hoped that the rain would end before we arose and needed to strike camp. I really hate dropping my tent and packing it up in the rain. It stopped around 6:00 am, so I crawled out of my warm bag and began to pack up all the gear inside before venturing outside. Thirty-five minutes later I pulled on my Gortex padding jacket and pants and crawled out into a cold, gray, wet morning. Several others were up, milling around in the cold as the rain began once more. I moved my packed gear into the boat when the rain let up again. During this lull I managed to drop and pack my soaked tent, slipping it into my forward, not-so-dry, dry hatch. Grabbing the JetBoil stove, I boiled water and prepared a cup of Starbucks Instant Columbian coffee. Now I’m not really a fan of Starbucks, but their instant, a combination of ultra-finely ground and freeze dried coffee, makes a great cup on the trail, with virtually no mess to clean up afterward. The rest of the boiling water went into a packet of instant oatmeal: not gourmet, but warm and hardy on a cold, wet morning. One couple, Diana and Ed, couldn’t find a dog sitter for their two Chihuahuas, so the dogs joined us on the trip. Each one had a sweater for protection from the cold, and s small lifejacket. They rode in the open cockpits, the male with Ed, the female with Diana, nestled on tiny dog beds between the paddlers knees. 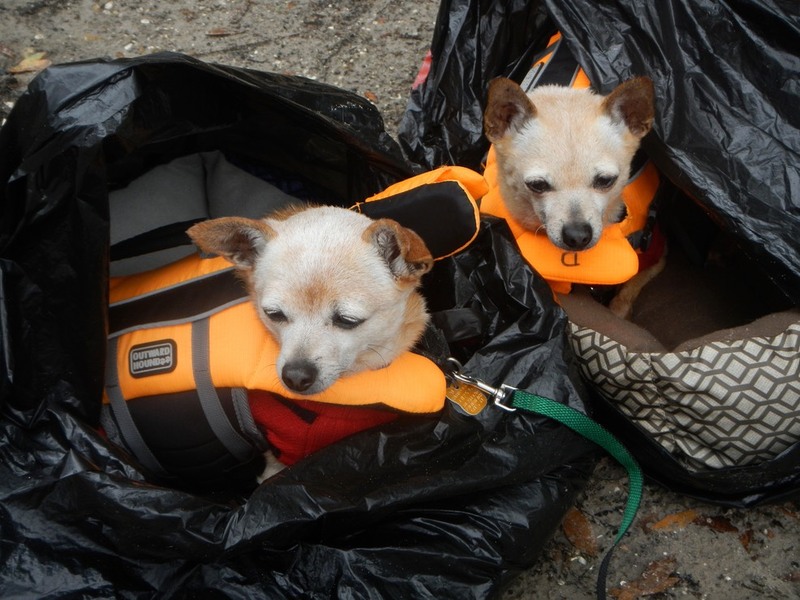 On this cold, rainy day, each dog and bed was nested inside a black garbage bag that served to keep them dry in the rain. They never made a sound or fussed about anything on the whole trip. There was no hurry to leave, as we had less than seven miles to paddle. Everyone packed up slowly, and then we were off. Even in the rain, the river was beautiful, maybe even more beautiful than on a sunny, blue sky day. Normally, we would never set out on a day paddle in the rain. We’d stay warm and dry at home and miss all this. These extended trips, even for only a couple of days, allow me to experience the natural world in all its moods, to reconnect with nature and its rhythms in ways that the constructed world I live in hides from me, that can even make a cold night and rainy morning something special to be sought after. It’s about as close to the spiritual as I get. The video above gives you some sense of what it was like on the river that morning. Too soon we were at our pullout at the Gardner boat ramp. Linda called her friend Mario who shuttled us back to Pioneer Village to pick up our cars. At the Village, linda discovered that she didn’t have her keys, so I drover her back to Gardner, picked up both her’s and my boat, and drove back to Pioneer Village. We loaded Linda’s boat onto her Suburu, said goodbye, and then I headed back across the state for the several hour drive home. I was glad I had come.